Hollywood’s favorite blonde sweetheart Reese Witherspoon is in the new film A Wrinkle in Time, which is out in theaters this weekend! Even though it’s based on a children’s book, I, as a 23 year old going on 24 still want to see it at some point. Maybe I’ll catch it on DVD in a few months. She stars in the movie alongside Oprah and Mindy Kaling, and the trailer for it alone has my jaw to the ground with the powerful vibes of this all-girl trio! What a better way to celebrate an adaptation of literature AND Women’s History Month?! In honor of Reese being in this film, I’ve decided to feature her for this week’s Fan Art Fridays. 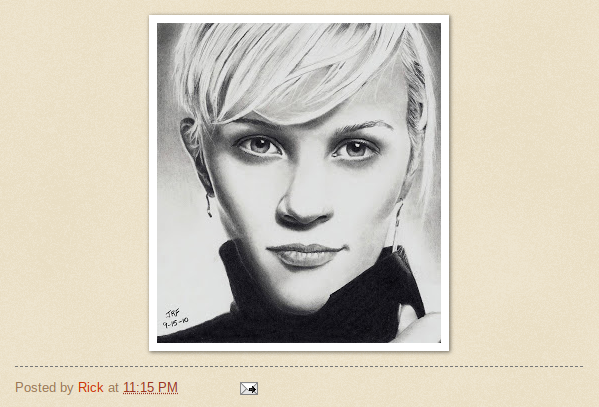 I found this amazing black-and-white sketch of Reese Witherspoon on Deviant Art, which, interestingly is by Rick Fortson (a.k.a. Dr. Pencil), the father of one of my favorite indie musicians Andrew Belle (born Drew Fortson)! I love how sweet yet stern the actress looks in the sketch. It’s like she’s staring sweetly but also quite seriously into your soul. If you love this sketch, you can buy it on Rick Fortson’s site.